>98% Pure active Recombinant human TRAIL/Apo2L. The activity is determined by its ability to induce apoptotic cell death in TRAIL-sensitive U343MG cells. The ED₅₀ for the effect is 1-3 ng/ml. 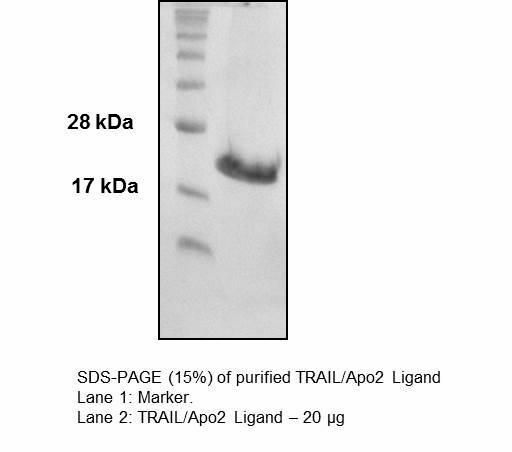 Human TRAIL (TNF-Related Apoptosis Inducing Ligand), also called Apo2 Ligand (Apo2L), is a cytotoxic protein that activates rapid apoptosis in tumor cells, but not at normal cells. The recombinant human TRAIL/Apo2L is a single polypeptide chain containing 168 amino acids and has a molecular mass of 19.6 kDa.